Come enjoy a morning with us catching Chesapeake Bay Blue Crabs! We will leave around 6AM and travel a few miles from the marina to area that has been productive for us. We will crab anywhere from 5′ to 25′ deep with an average depth of about 12′. We will be using approximately 1200′ of line. 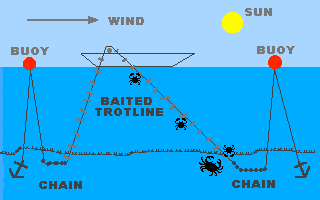 This is an illustration of what a trotline looks like once set in the water. Each end of the line start out with heavy anchors or weights to hold the line in place. The anchors are attached to a float on top of the water which are attached to a heavy piece of chain that pulls the line back down to the bottom. We have baits about every 3′ along the 1200′ line. Once the line is set we go to one end of it and start running it. We put the line on a roller which is attached to the side of the boat and run slowly down the line. You and your party get to take turns standing up and dipping the crabs as they come up the line. The crabs hold onto the baits while they come up from the bottom. This type of crabbing can be done by all ages young or old which make this a great family, friend or coworker experience. We see that trotlining for crabs is a very personal experience for people who have never done this before, and we see a competitive side of people also. With fishing everyone counts how many they caught and how big they are; with crabbing everyone gets to see the crabs you are dipping (OR MISSING). You will be amazed how well someone’s memory is of how many crabs their brother or sister or best buddy missed. Yes, missing is a part of this which is probably what makes this such a personal experience. Once we’re done catching the crabs we give you your choice of us steaming them for you back at the marina or you taking them home and steaming them up with your own recipe. 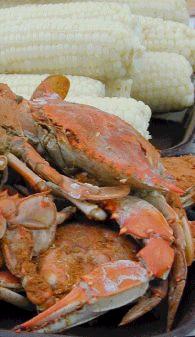 If we are steaming them for you we have to come back in a little early to give us enough time to steam the crabs. Come down and give us a chance to show you how much fun you can have crabbing on the Chesapeake Bay with Natural Light Charters. For information on rates, visit our Charters section.